Inexpensive and cute way to clean pet hair off my keyboard and I use it to pickup crumbs from the table. This adorable mini vacuum cleaner will help you keep your keyboard clean and dust-free. The portability of this keyboard vacuum makes it perfect not only for the office, but your car or purse. The magnetic 9700 rpm high-speed motor and ultra fine air filter pack a punch so you can clean up small messes quickly. So cute ! And it works fine on my keyboard! 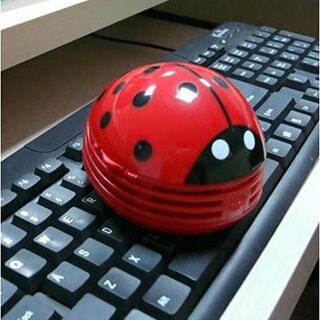 I recommend this Ladybug ! I love this Ladybug! i am putting one in my car to help keep my seats clean. It took me a while to figure out how to get the top off so I could put batteries inside. It works just fine. Cleaned my keyboard great. I am pleased with this purchase and I would recommend to a friend. have not been able to open to insert batteries. Neighbor also tried. DON'T WASTE YOUR MONEY ON THIS. I was pleasantly surprised as to how well this little vacuum cleaner worked. I would recommend this to others and probably buy it as a gift for someone. I wanted to love this - and I was hoping for a little more than what I actually got. It looks cute on my desk, but doesn't really 'clean' so I use for ornamental purposes. I thought this was a cute little meat board vacuum cleaner. It is cute, but it doesn’t pick up as well unless you use force, which you don’t want to do on a keyboard. I’ll keep it, but I wouldn’t buy it again. Bought it because it was so cute but also really works well. Only problem was opening it for first time but now opens fine when I need to clean it. Cleans better than I thought. Bought 2 more for my sisters. Wished they came in other shapes too! It is basically exactly what you see in the image. It required two double-A batteries so there's that and I am not sure how much it actually cleans. It is more of a quirkly/ decorative piece for the office. Its cute but I don't think it works that great. I do like it but shouldn't be advertised as a good vacuum for keyboards or computers. Love it! It really works and it looks cute on my desk. Soooooo cute. Honestly haven’t used this yet. Cute but does not work well. My 9 year old granddaughter loves ladybugs so I just had to get this for her. She loves it. Very cute and does the job too. Couldn't figure out how to use it! I really like the ladybug vacuum very much. It makes a very cute accessory for my desk and I use it everyday and it works very well. "how do you open it to put in batteries"
It opens by taking top(ladybug wings) and pulling straight up. Wife thanks it is cute and she has to have it. Doesn't matter if it works or not. To keep my keyboard clean and it is cute.